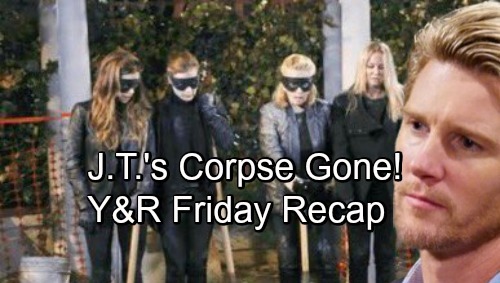 The Young and the Restless (Y&R) spoilers update and recap for Friday, November 2, tease that some shockers will strike in Chancellor Park. For starters, Sharon (Sharon Case) will show up in a mask and give the others a fright. She’ll explain that she was trying to blend in with the Halloween crowd. Phyllis (Gina Tognoni), Nikki (Melody Thomas Scott), Victoria (Amelia Heinle) and Sharon will soon shift their focus on the hole. Once the digging’s done, they’ll realize J.T.’s (Thad Luckinbill) body isn’t there. The cover-up crew will wonder if J.T.’s (Thad Luckinbill) out to get them or if someone else moved his corpse. They’ll be glad they don’t have to move a body after all, but they’ll realize their mess just got more complicated. Over with Kyle (Michael Mealor), he’ll gloat to Summer (Hunter King) about his wonderful evening with Lola (Sasha Calle). Of course, Summer won’t think Kyle and Lola stand a chance. She’ll insist that Lola will wise up and break things off eventually. The next morning, Phyllis will head to Jabot and make some changes. She’ll invite Lauren (Tracey E. Bregman) to be her new COO and keep Kyle right where he is. As for Billy (Jason Thompson), he’ll be going back to his old marketing position. Later, Kyle and Billy will make a pact. They’ll put their differences aside to keep an eye on Phyllis, but Billy won’t want any dirty tricks from Kyle. Kerry (Alice Hunter) will also meet with Phyllis and Lauren in Friday’s Y&R episode. They’ll strategize about replacing the products Ashley (Eileen Davidson) took. Phyllis will be expanding Jabot’s boutique plan as well. The gang will definitely feel good about the direction they’re headed in. Other Young and the Restless spoilers say Victoria, Nikki and Sharon will meet at Crimson Lights. When Rey (Jordi Vilasuso) appears, he’ll joke about their top-secret charity work. Rey will want to know who they’re helping, which will bring some blunders from the ladies. They’ll scramble to provide a believable story, so Rey will undoubtedly be even more suspicious. Afterward, Sharon will mention her latest fight with Nick (Joshua Morrow). She’ll assure Rey that she set him straight, so the detective will think that’s great news. Rey will want to support Sharon if she needs him. He’ll be able to tell that she’s feeling pretty stressed. Sharon will eventually point out that she may be single, but she’s not available. Rey will promise that he’s only offering friendship. He’ll add that he’s been making some progress with his estranged wife. Back with Victoria, she’ll feel uneasy over all the J.T. drama. Victoria will tell Nikki that they can’t be certain of anything now. At Dark Horse, Nick will share his plans with Abby (Melissa Ordway). He’ll think he needs to do something big and win Sharon over. Abby will argue that maybe Nick should back off. She’ll think it’s clear that Sharon wants space, but Nick will express frustration. He’ll hate that Sharon refuses to forgive him for the mistake he made with Phyllis. The Young and the Restless fans won’t want to miss all the excitement on Friday. We’ll give you updates as other Y&R details emerge. Stick with the CBS soap and don’t forget to check CDL often for the latest Young and the Restless spoilers, updates and news.